Select the MX version from the drop-down menu. If any MX 4.4 features are required, e.g., connecting via Ethernet for staging, select MX 4.4. 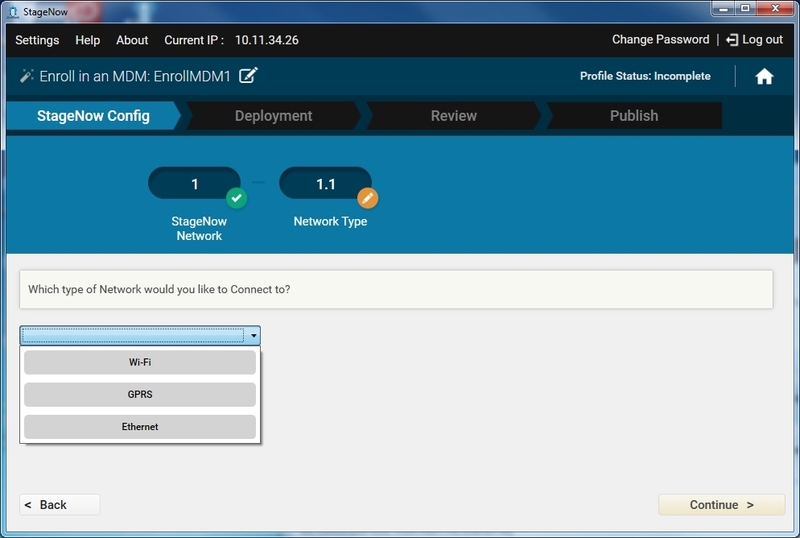 Select the Enroll in an MDM Wizard, and select Create. To choose to connect to this network using StageNow bar codes, select Yes, and then select the type of network. Select Continue. See Profiles / Connect Network for instructions on connecting to a network and populating the settings window. In the Deployment section of the wizard, select a method for performing the enrollment and select Continue. For No, I want to Download the file to my device, see Setting Types / File mgr for instructions. For Yes, I want to Install the file, see Setting Types / AppMgr for instructions, and skip to Step 10. Select whether or not to download an MDM agent support APK. If you select Yes, see Setting Types / File mgr for instructions. Select whether or not to download an MDM configuration file. If you select Yes, see Setting Types / File mgr for instructions. 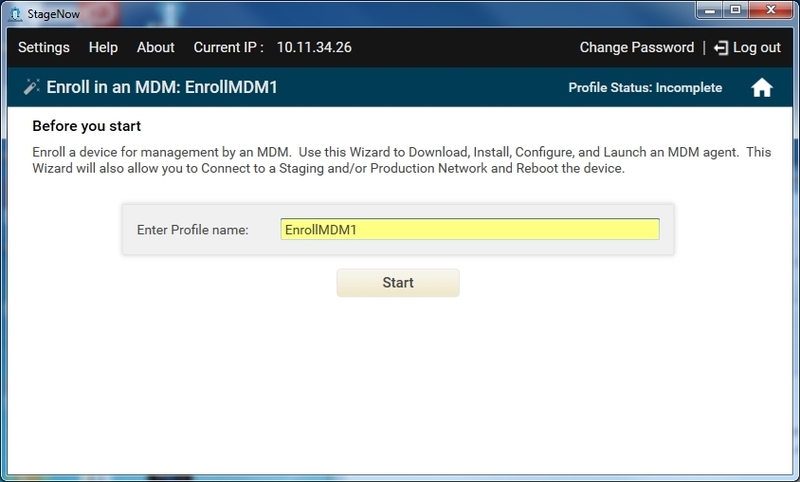 Select whether or not to install an MDM. If you select Yes, see Setting Types / AppMgr for instructions. Select whether or not to connect to a production network. If you select Yes, select a network type. See Profiles / Connect Network for instructions on connecting to a network and populating the settings window. Select whether or not to reboot a device. If you select Yes, see Setting Types / Power for instructions. Select the MX 5.1 from the drop-down menu. 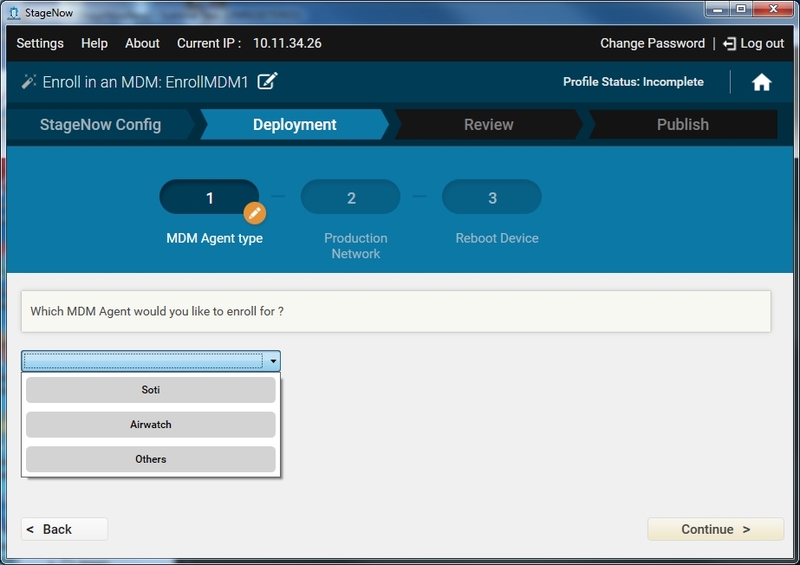 In the Deployment section of the wizard, select the MDM agent for which to enroll. Note: If you select Others, go back to Step 8 of the previous procedure. Select whether to download a configuration file. If you select Yes, see Setting Types / File mgr for instructions. If you selected AirWatch, select whether to enroll an Mx Service. If you select Yes, select a method for performing the enrollment and select Continue. For Yes, I want to Install the file, see Setting Types / AppMgr for instructions. Select whether to launch an Mx Service APK. 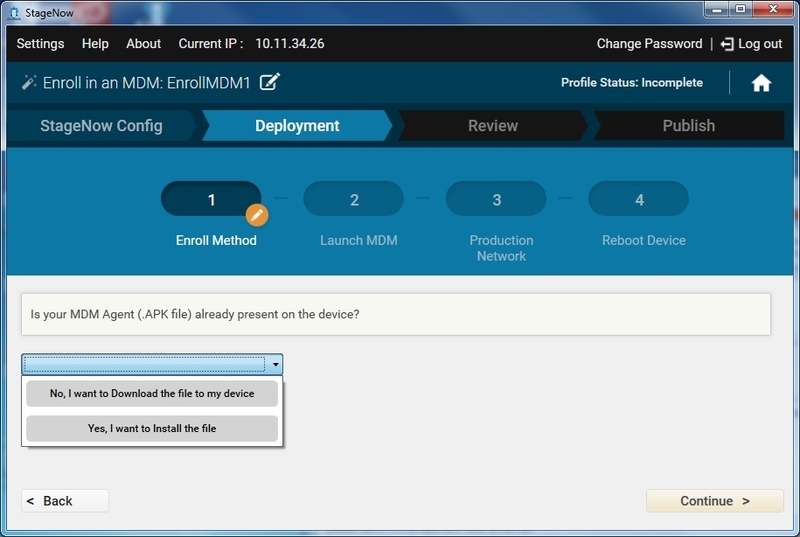 If you selected AirWatch, select whether to enroll for MDM Agent. Select whether to download a Remote Control APK file. Select whether to launch the Remote Control APK. If you select Yes, see Setting Types / Intent for instructions. Indicate whether the APK file is already present on the device. If you selected SOTI in Step 8, select whether to launch the SOTI APK. If you select Yes, see Setting Types / Intent for instructions.